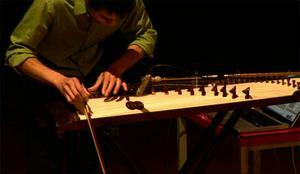 Xo Xinh is a Vietnamese electro-acoustic composer, performer and improviser. Most of his works aim to re-contextualize the essence of traditional instruments through spectral processing and interactive manipulation of the acoustic sound by the computer, as well as to explore the transformation of traditional music through the contemporary and experimental medium. He received his MFA in Electronic Music at Mills College in 2012 and has performed his music since then throughout the U.S., and in Europe, Australasia and South America. He is currently an Instructor of Electronic Music at Evergreen Valley College.